Well the New Year is here and I would like to wish everyone a happy, prosperous and recycling New Year. 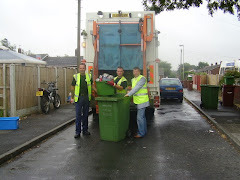 We (the Hudsons) have had our first collection of the year which also included the recycling box which due to the festivities did include two box loads of glass, plastics and cans which have been collected over the period. We also made a second trip to the Welbeck Household waste site with the excess rubbish generated between xmas and the new year. Still trying to reduce the old plastics but as I keep saying the manufacturers do not help in the slightest with that issue. Now I know there has been lots of talk about stock piling of materials but I am pleased to say that Wakefield have outlets confirmed for all its recycled material so please keep separating your rubbish and lets achieve 50% + recycling rates over the coming year.